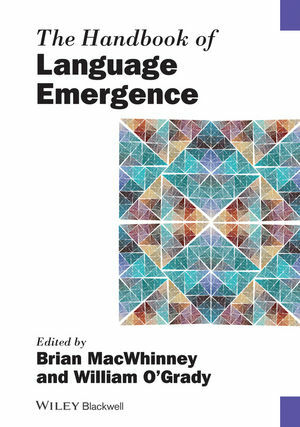 This authoritative handbook explores the latest integrated theory for understanding human language, offering the most inclusive text yet published on the rapidly evolving emergentist paradigm. Brian MacWhinney is Professor of Psychology, Computational Linguistics, and Modern Languages at Carnegie Mellon University. He has published extensively over many decades, and developed the Competition Model of first- and second-language acquisition, processing, and disorders, which shows how language learning emerges from forces operating on lexically-based patterns across divergent timeframes. He is the author of The CHILDES project: Tools for Analyzing Talk, 3rd Edition (2000 and editor of Mechanisms of Language Acquisition (1987) and The Emergence of Language (1999). William O’Grady is Professor of Linguistics at the University of Hawaii. He has undertaken extensive research in syntax and language acquisition, focusing more recently on the importance of processing for an understanding of how language works and how it is acquired. He is the author of numerous volumes including Principles of Grammar and Learning (1987), Syntactic Development (1997), and How Children Learn Language (2005). His book, Syntactic Carpentry (2005), sets out his ideas on the centrality of the processor in language acquisition.